The weather has been lovely and sunny so with a few days off work, we took the train to Balloch on the south side of Loch Lomond and cycled to the village of Luss. It was an easy-going day. 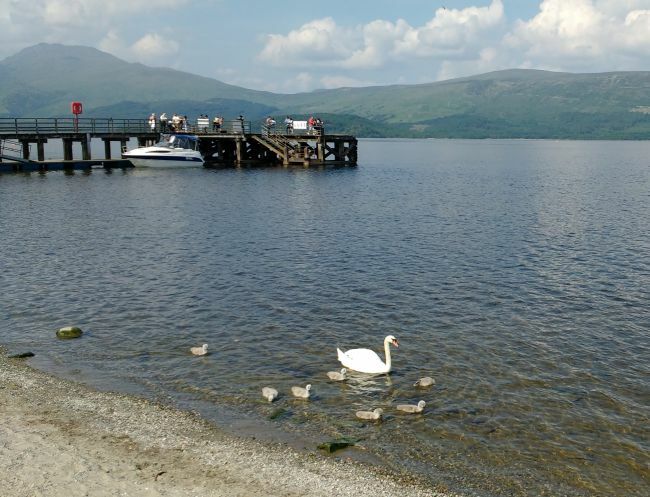 The area around Loch Lomond is spectacular and it attracts plenty of visitors from all over the world. 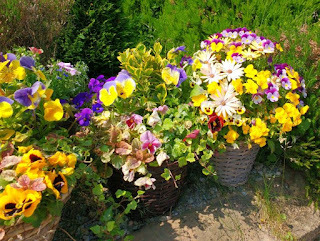 I heard French, German and an oriental language, which may have been Japanese, as well as English, being spoken. 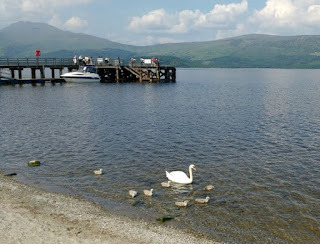 Loch Lomond is the largest inland stretch of water in Great Britain by surface area.The loch also contains many islands, including Inchmurrin, the largest fresh-water island in the British Isles.The Loch is part of the Loch Lomond and The Trossachs National Park which was established in 2002. Loch Lomond has many small islands called 'crannogs'. 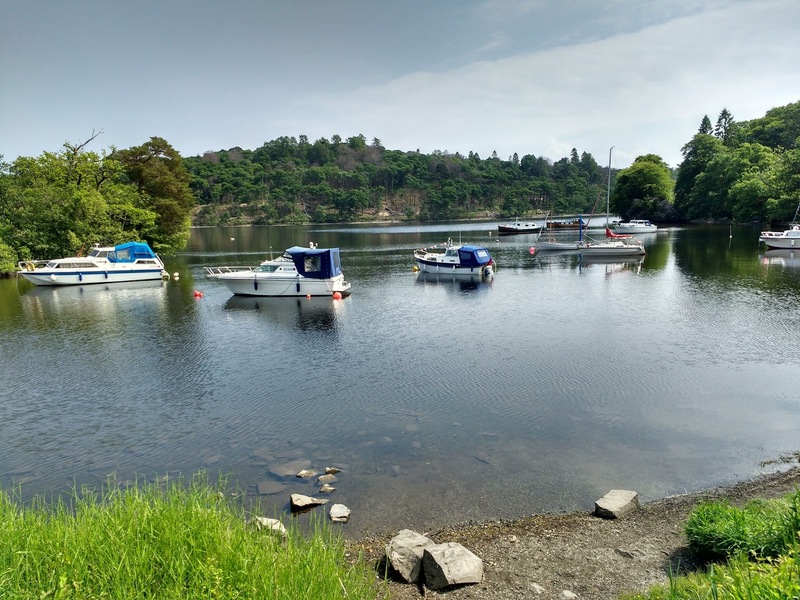 These were built by Iron Age people over 2500 years ago when wooden piles were placed in the loch to enable dwelling places to be built free from predators. They were accessed by a causeway. In later periods rocks were added to the wooden structures to make an island and to allow dwelling places to be constructed with rocks. 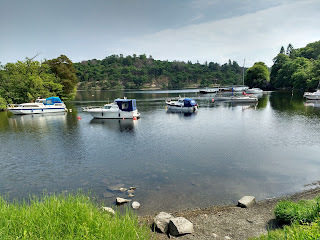 In the photograph below a crannog can be seen behind the small boats. The five-star Cameron House Hotel and Resort is situated on the banks of loch Lomond. 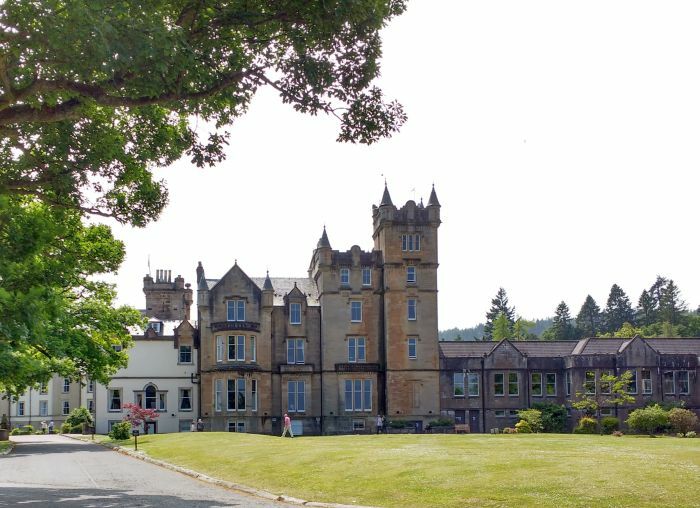 It has an 18-hole Championship golf course, a luxury resort spa and a range of outdoor pursuits. 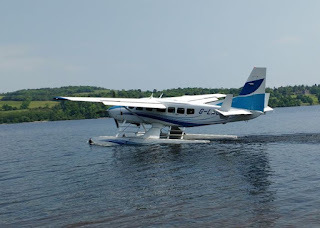 When we were there, a seaplane was taking visitors on a flight around the area. 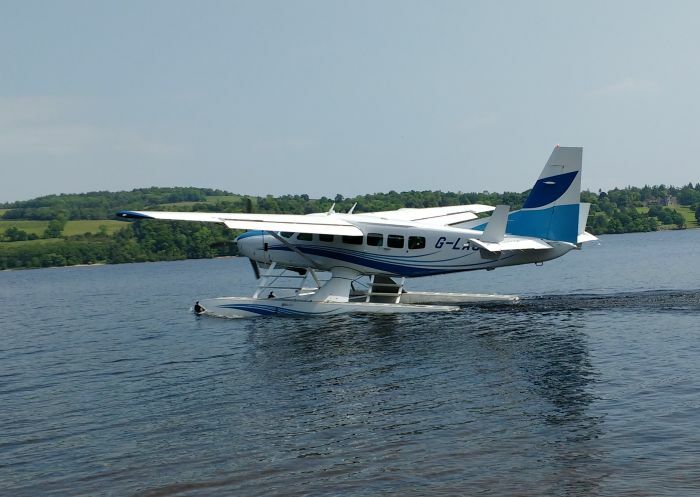 We watched the seaplane departing on another journey with a full complement of passengers. 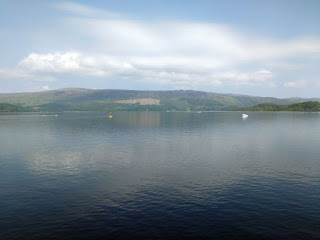 We then continued on the cycle path to Luss. 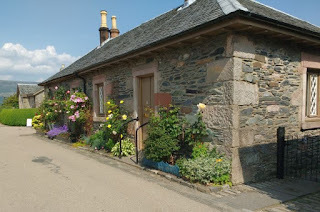 Although it is not compulsory to cycle on the cycle path, it is recommended, as it is adjacent to the busy A82 road. The cycle path is an old footpath and has quite a few blind bends in it so care has to be taken when riding along. Across from the Loch Lomond Arms Hotel in Luss is the Queen's Tree. This was planted to commemorate HM Queen Elizabeth II, on 9 September 2015, overtaking her great-great-grandmother Queen Victoria to become the longest reigning monarch in British history. 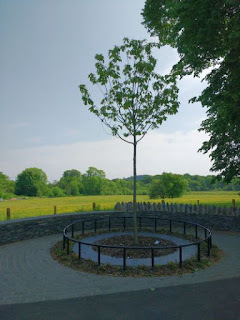 The tree is a Red Oak (quercus robur), and its base is surrounded by an inscribed stone circle. 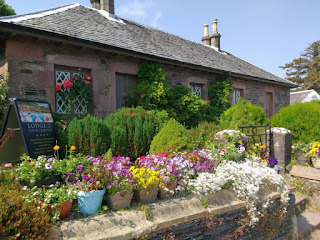 One of the things visitors notice about Luss is the colourful displays of flowers in the village. Many of the villagers have good displays of flowers in front of their houses. Below shows some of the displays. 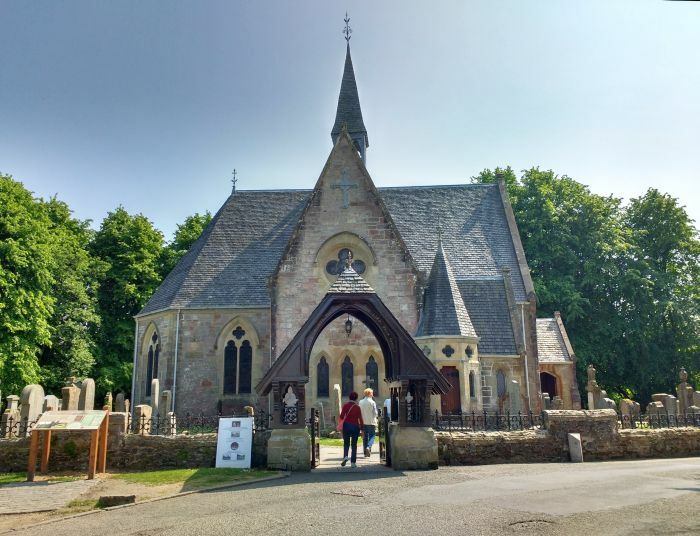 The church in Luss, which was built in 1875, used to perform more marriages in Scotland than any other church. 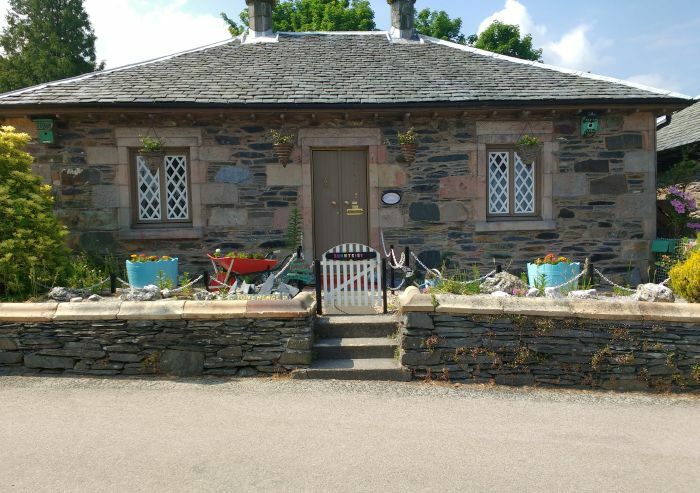 This was scaled down in 2013 at the request of the then minister who wanted to spend more time with the 750,000 visitors to the area. At the entrance to the church is a quote from the Psalm 122 v1 "Let us go into the house of the Lord." 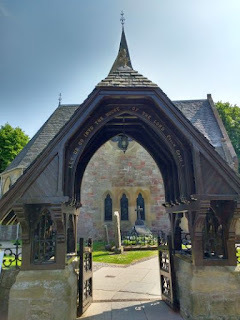 When we were there, a coach load of French visitors were being shown round the church. Luss has a small pier from where many small ferries take visitors on trips around the loch. 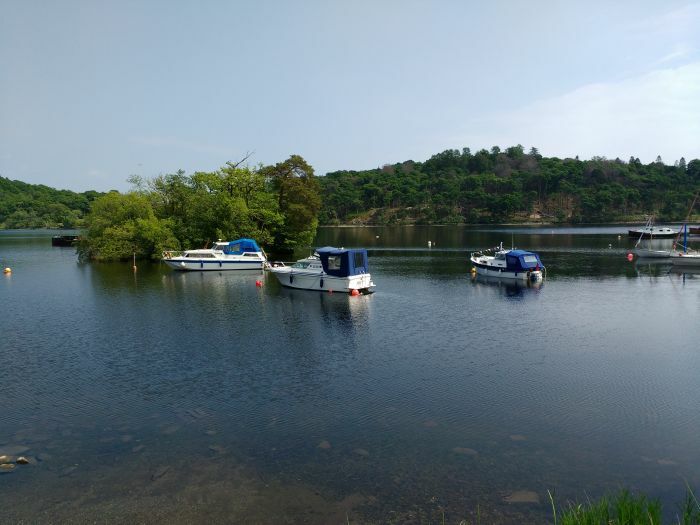 Visitors can visit many areas and islands on the loch including Rowardennan, Balloch and Balmaha and visit the islands including Inchmurrin and Inchcailloch. Some of the ferries also have bike racks so it is possible to take a bicycle and continue with a tour in another area of the loch. There were some Highland Cows in a field in Luss - a mother and two calves. These were very popular with the visitors and the cows were enjoying all the attention they were getting. 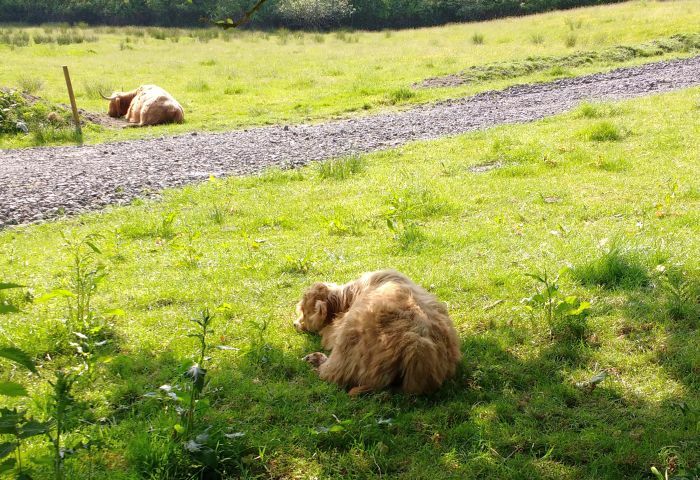 As it was very warm, the cows were having a wee lie down. After a great day in Luss, we cycled back to Balloch to have some fish and chips in Palumbo's cafe before making our way to the train station for the journey home.